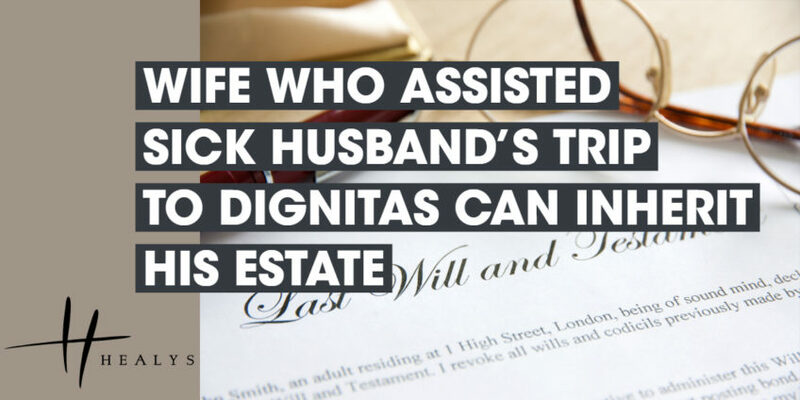 A woman who reluctantly assisted her gravely ill husband in travelling to Switzerland where his life was ended by Dignitas will nevertheless inherit his estate, after a judge ruled that many people would have done the same for a loved one. The husband, who was in his 80s and had led a successful life as a businessman and writer, was suffering from an incurable disease which would inevitably lead to progressive disability and death. He contacted Dignitas without his wife’s knowledge and, after discovering what he had done, she repeatedly urged him to reconsider. He was, however, adamant that he wished to end his life and she assisted him in making travel arrangements to Zurich. She went with him to the clinic, but gave no direct assistance in his consumption of the substances that killed him. The police later investigated the matter, but a decision was made that it would not be in the public interest to prosecute her. The wife, however, was concerned that her inheritance from her husband would be forfeited by operation of the Forfeiture Act 1982. Section 2 of the Suicide Act 1961 provides that it is an offence, punishable by up to 14 years’ imprisonment, if someone does an act capable of encouraging or assisting the suicide or attempted suicide of another. The Forfeiture Act provides that a person who unlawfully kills another person cannot benefit from their estate. She sought relief from the risk of such forfeiture. In ruling on the matter, the judge was satisfied, on the balance of probabilities, that what the wife had done amounted to a serious offence. However, in granting the relief sought, he noted that the husband was a man with a strong independent will who had been assessed as having capacity to make decisions for himself. His unambiguous intentions had been clearly recorded, as had his wife’s attempts to discourage him, and the couple had enjoyed a strong and loving relationship during their 34-year marriage. The wife was a woman of substantial means in her own right and there could be no suggestion that she had been motivated by money. In the event of forfeiture, the husband’s estate – including his half of the family home –would pass to the wife’s brothers, who had evinced no wish to receive it.